Why Did Elizabeth I Imprison Mary, Queen of Scots? Mary, Queen of Scots sought refuge in England after being imprisoned in Scotland. Instead of help, Elizabeth I imprisoned her. To understand why, her past needs to be explained. On May 19, 1568, Mary, Queen of Scots, was imprisoned in England by Elizabeth I. She actually came to England to seek refuge, after being imprisoned in Scotland for the last year. She wasn’t initially executed though. It took over 20 years for Elizabeth to finally decide that her cousin was going to die. What led to the imprisonment and execution of the young Scottish Queen? Why did Elizabeth I imprison Mary, Queen of Scots? Mary was the only daughter of James V of Scotland. She was Margaret Tudor’s granddaughter and Henry VII’s great-granddaughter, making her a rightful heir of the English throne. When she was less than a year old, her father was killed on the battlefield and she was crowned Queen of Scotland, but the Scottish nobles wanted more; they wanted the English throne. At the time of Mary’s coronation in 1543, Edward VI was sitting on the English throne. The noblemen of Scotland attempted to arrange a marriage between the young English King and their infant Queen. This was the best way to get her onto the throne. King Henry VIII of England’s will stripped the Scottish claim to the throne, with Henry VIII’s sister, Mary Tudor’s children and grandchildren gaining third, fourth, fifth and sixth place after his three children. However, they also arranged a pact between themselves and France, who was at war with England. This caused the marriage attempts to fail and Mary was sent to France to be brought up in a royal way. While in France, Mary married the dauphin of France, Francis, at the age of 15 while her mother was named Queen Regent. She was extremely close to her mother, her husband and her father-in-law, Henry II but all three died within months of each other, leaving Mary heartbroken and feeling very alone. Historians believe that she never recovered after these close deaths. On August 19, 1561, Mary returned to her own country to take her place on the throne. However, religion was a major problem. While in France, she had been raised as a strict Catholic and held onto those views. During her absence, the Scottish people had turned to Lutheranism and didn’t want the trouble with religion – nothing like the trouble that England had had over the decades, especially with Mary I.
Mary continued to attack the French Protestants, which angered the English Queen, Elizabeth I. Elizabeth even cancelled a meeting with her cousin in 1562 because of the religious problems. By this point, Queen Elizabeth had brought some peace to England with regards to religion. She had found a balance between Protestantism and Catholicism to appease all the English people. Mary, Queen of Scots, attempted to do something similar with her people. She accepted her government, which was made up of Protestant men, and tried to accept the people’s ways. Unfortunately, the young Queen was always watched suspiciously because of her religious views. Elizabeth I of England attempted to help neutralise Mary’s religious views by arranging a marriage between her cousin and Robert Dudley, 1st Earl of Leicester. This proposition also came with the promise that Mary would be placed next in line on the throne – by this point Mary Tudor’s line had been embarrassed and stripped due to the Nine Day Queen, Lady Jane Grey. Mary refused, along with Robert Dudley, and she chose to marry her cousin – another grandchild of Margaret Tudor – Henry Stuart, Lord Darnley. This caused problems with the Scottish Court as Lord Darnley was also a Catholic. Since they were cousins, they should have sought a papal dispensation but this did not happen, causing further problems! Not only was Henry Stuart a Catholic; he was spoilt and a drunk. The Scottish people didn’t like him and the Court members disapproved. Elizabeth I also felt threatened. Any children of the two would have a stronger claim to the English throne since both parents were great-grandchildren of Henry VII. The marriage between the Queen and Lord Darnley was not a happy one. He was constantly jealous, especially of her Italian secretary, David Rizzio. Darnley believed the two were getting too close and, with the help of other members of the Court, murdered Rizzio. Mary was pregnant at this time and was heartbroken at her husband’s actions. However, she could do very little at the time. Three months later, Mary gave birth to her only child – a son who she named James after her father. James would later become James VI of Scotland and James I of England after the death of Elizabeth I in 1603. After this, there was talk of divorce but the Scottish Lords wanted to remove Lord Darnley in others ways. While there is no real proof, rumour is that Mary had her husband killed. The marriage between them never went back onto the same terms. While the two were staying at Kirk o’Field, Mary stated that she had to leave to see some friends. This was in the middle of the night and would have been dangerous for the Queen of Scotland. The Scottish countryside in the 16th century was not safe to be alone in at night. Coincidently, there was an explosion and Darnley was found dead. Adding to the conspiracy theory, shortly after that, Mary remarried to the Earl of Bothwell; another marriage that the Scottish people or Court did not want. Bothwell was the main suspect for the murder of Mary’s second husband and Darnley’s father wanted him to be tried for the death. Mary agreed to the trial but did not allowed her father-in-law to collect the evidence he needed, which meant that Bothwell was acquitted. The marriage to Bothwell was seen as invalid to the Catholic people. Bothwell was previously married and divorced his wife 12 days before the marriage to Mary. This was not recognised in the Catholic religion without the permission of the Pope. The two married under the Protestant rites, which was also not recognised by the Catholic people. The Protestants were shocked that Mary would marry a man who was accused of killing her husband. Bothwell’s former peers turned against the couple with 26 working together to raise an army to battle against them. While there was no battle, they did meet on June 15, 1567. As her own forces deserted her, Mary was taken to Edinburgh and the people denounced her as a muderer. Mary was pregnant during this time with twins, but miscarried them between July 20 and 23, during her imprisonment in Lock Leven Castle. After that, the government forced her to abdicate her throne. One-year-old Prince James was named King James VI of Scotland, with Lord Moray his regent. What happened to Bothwell? He went into exile but was imprisoned while in Denmark. During imprisonment, he became insane and in 1578, died. So, Why Did Elizabeth I Imprison Mary, Queen of Scots? It seems like Mary didn’t do anything to Elizabeth I to be imprisoned. When Mary escaped from Loch Level on May 2, 1568, she attempted to seek refuge from her cousin. On May 18, she was placed in Carlisle Castle for “protection” but was effectively imprisoned from May 19. While Elizabeth didn’t have a real reason to imprison her, she didn’t trust her Scottish cousin. Mary had a strong claim to the English throne and Elizabeth wanted to find out why the Queen had abdicated and fled. She asked about the murder of Darnley and whether her cousin was guilty and why the 26 lords sought battle and forced her to abdicate. The real reason for her imprisonment was fear. Elizabeth’s claim to the throne was relatively weak since she was declared an illegitimate child of Henry VIII. While she had won the people over, she always feared that her throne would be taken from her by someone with a more powerful claim, especially her Scottish cousins. She was lucky that Mary, Queen of Scots was a Catholic and the English people didn’t want more problems with religion. However, Elizabeth must have had some feelings for her cousins; she must have wanted to set her free at some point. She held Mary in various castles until 1587, when she finally decided to execute her. However, even up until that point, Elizabeth hadn’t truly decided that she wanted to see her dead cousin die. It seems similar to the way that her half-sister imprisoned her for a few years, in fear of her taking the crown. 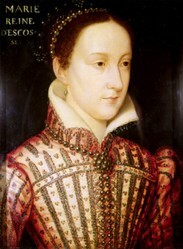 Mary, Queen of Scots was executed on February 8, 1587. She only found out about her execution the day before, when she quickly put together her will and wrote to the King of France. She requested to be buried in France, where she believed to be her true home, but Elizabeth had her buried at Peterborough Cathedral but she was exhumed and reburied in Westminster next to her cousin, Elizabeth I. Thank you. Glad you found it informative. SO interesting!! Thank you for this very informative read! When the heiress of Haddon Hall eloped with her lover, Elizabethan society held its collective breath. What would Sir George, Baron Vernon, do now? The portraits of Elizabeth I don't show her true appearance. When she was 29, she contracted smallpox and it led to changes in her flawless appearance.